Allan Bennett, one of England’s leading playwrights, is not as familiar to American audiences as he might be, although fans may recall that he was a founding member of the comedy troupe, Beyond The Fringe (along with Peter Cook, Jonathan Miller and Dudley Moore) and movie fans may recognize him as the screenwriter of the much-admired “Madness of King George”. It is a treat when any theatre company decides to produce a Bennett play. It is especially exciting to have a Bay area premiere of relatively new work such as “The Habit of Art.” Actually, Theatre Rhino presented this Bay area premiere last Spring, so the current production is a return engagement. We’re lucky to have it. Utilizing a play within a play format, “The Habit of Art” is constructed like nesting dolls—masks within masks within masks —and the result is fascinating. It is set on the stage of the National Theatre in London, where a company is rehearsing a new play about the poet W. H. Auden, and the composer Benjamin Britten, narrated by their biographer, Humphrey Carpenter. Donald Currie as the actor, Fitz, playing the role of poet W. H. Auden in Alan Benett’s “The Habit of Art” at Theatre Rhino. Photo Credit: Kent Taylor. Subtle complications ensue. Auden and Britten were both homosexuals at a time when they could be sent to jail. Thus, in some sense they lived as actors playing a part. And we are watching actors playing them. Of course, we are a watching a “play within a play” so what we see are not Auden and Britten as they were, but only as the playwright imagines them. But which playwright? Bennett or the fictional playwright of the play within the play? And, then, again, we are not seeing direct representations of Auden and Britten but actors playing the actors playing Auden and Britten in rehearsal. Furthermore, the actor playing Auden has difficulty remembering his lines, so we have to question even more deeply the truth of the story being told. And whose story is it? The playwrights? The actors?The characters Auden and Britten who are not merely characters but actual historical figures? Whose history is at play here, anyway? The intellectual challenges add up profusely, one atop the other, all reflecting on the theme of “The Habit of Art”. The script is an intellectual smorgasboard of the highest order. It is also superbly entertaining, thanks to careful, intelligent direction by John Fisher (who also plays the actor Henry who plays the character Benjamin Britten) and fine work by the entire cast. 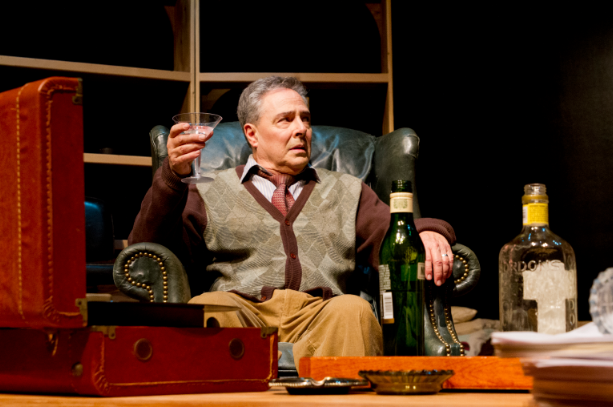 John Fisher as actor Henry playing the role of composer Benjamin Britten in Alan Bennett’s “The Habit of Art” at Theatre Rhino. Photo Credit: Kent Taylor. Donald Currie is fascinating to watch as he creates the dual characters of the heterosexual, but poetry-loving actor Fitz (who struggles to remember his lines) and the homosexual, “let it all hang out” Auden, whose indifference to such matters as personal hygiene and good housekeeping confuse our understanding of his “role” as “famous poet”. There are those Russian dolls again: one character encased in another encased in another encased in another creating a seemingly endless hall of mirrors effect. As Henry (actor)/Benjamin Britten (character), John Fisher performs as well as he directs. Henry has his own secrets, implied but never revealed, as does Britten. All of this is managed with maximum clarity, so that the viewer is challenged and engaged but needn’t be frustrated or confused. (from l to r) Michael DeMartini as Neil, the playwright, Justin Lucas as the actor Tim playing the role of prostitute Stuart, and Donald Currie as the actor Fitz, playing the role of poet W. H. Auden in Allan Bennett’s “The Habit of Art” at Theatre Rhino. Photo Credit: Kent Taylor. The remainder of the cast, playing the playwright of the play-within-the-play, the stage managers, and actors playing a young singer being tutored by Britten, a rent-boy visiting Auden and biographer Humphrey Carpenter are all equally good and each player has moments to shine. This fascinating and subtle intellectual jaunt will be deeply satisfying for demanding audiences, who go to the theatre to think as well as to be entertained. 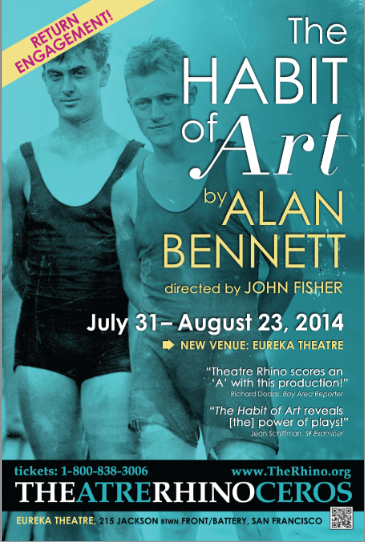 “The Habit of Art” by Alan Bennett, presented by Theatre Rhinoceros. Director: John Fisher. Scenic Designer: Gilbert Johnson. Costume Designer: Scarlett Kellum. Lighting Designer: Jon Wai-Keung Lowe. George, Assistant Stage Manager: Kathryn Wood. Donald/Humphrey Carpenter: Craig Souza. Kay, Stage Manager: Tamar Cohn. Fitz/W. H. Auden: Donald Currie. Tim/Stuart, a prostitute: Justin Lucas. Henry/Benjamin B ritten: John Fisher. Charlie/Boy, a singer: Seth Siegel. 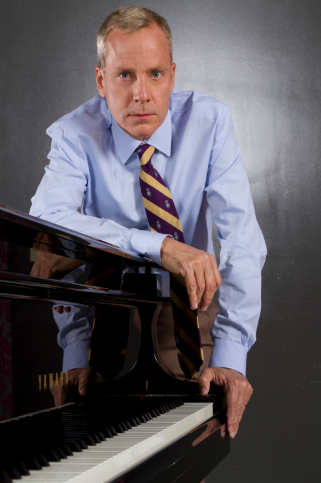 Neil, Playwright: Michael DeMartini.